Which countries have contributed the most to our advancement? Which people do best at school, and which people have the highest IQ? All these are important contributing factors when deciding where to visit next, no doubt. Luckily though, Vouchercloud has done the legwork for you and diligently researched and ranked the top 25 countries in the world by intelligence. 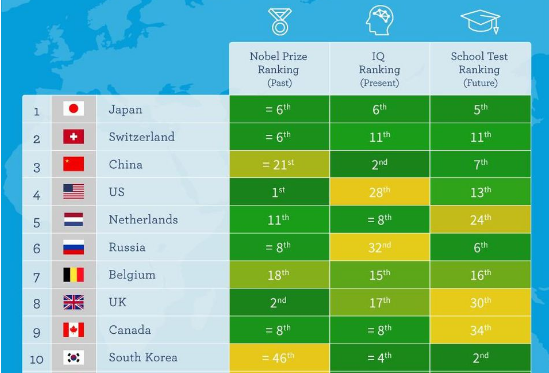 It quantifies intelligence to include the number of Nobel Prizes each nation has won to represent historic intelligence, the current average IQ and education attainment to represent the potential intelligence of the next generation. Asia and Europe dominate the list, with Japan taking the top spot thanks to its high placing across all three metrics where it came fifth overall in the school test ranking and sixth overall in both Nobel prizes and current IQ. The US comes in an impressive fourth. Although its ranking is flattered greatly by its extraordinary dominance in the Nobel category where at 368 prizes, it has nearly treble the UK in second place. However, in the current IQ the US comes a lowly 28th and school ranking a middling 13th—neither of which bodes well for its future ranking. And while Europe has impressive five nations in the current top ten—Switzerland in second, Netherlands in fifth, Russia in sixth, Belgium in seventh and the UK in eighth—it’s Asia that points to the future. Coming in at 25th on the ranking is Singapore—its position greatly skewed by its lowly ranking of 73rd for Nobel prizes when it ranks first in both current IQ and education attainment. 1. Which of the following does NOT qualify the intelligence? A The number of Nobel Prizes. B The current average IQ. 2. Why did Japan take the top spot? A Because its school test ranked highly. B Because it won the most Nobel prizes. C Because its current IQ is the highest. D Because it ranked highly across all three metrics. A The US has nearly twice the UK in the Nobel category. B Asia has impressive five nations in the current top ten. C The UK ranks first in both current IQ and education. D Education attainment represents the potential intelligence of the next generation. 4. Europe has five nations in the current top ten which does NOT include ______.